ABOVE: David Smith, Home of the Welder, 1945. Steel, 21 x 17 3/8 x 14 inches. Tate, Lent by the American Fund for the Tate Gallery and the Estate of David Smith, fractional and promised gift, 2000. Photo by David Smith,	© 2006 The Estate of David Smith/Licensed by VAGA, New York. With the arrival of World War II, metal supplies became increasingly scarce, and Smith worked on an assembly line welding locomotives and tanks. During this time he produced few sculptures, and by the war’s end he had backlogged a wealth of ideas. 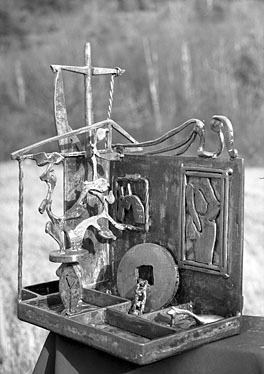 The dozens of works he created in 1945 showed a striking new direction for his art: looking to the metaphorical dimensions of Surrealism, Smith began to incorporate an intricate personal symbolism into his sculpture. Although he had previously used such symbols to voice social protest, he now turned away from political themes toward more autobiographical explorations. Birds, plants, and abstract organic forms began to proliferate in his imagery, often arranged upon a tablelike dioramic platform, as in Home of the Welder (1945). However, even at their most literal, these pieces provided an ambiguous window into the artist’s psyche, suggesting but rarely revealing his true emotions.